Franciska de Jong is Executive Director of CLARIN ERIC (www.clarin.eu). She leads the expansion and sustainability of CLARIN, the outreach to new research communities, and the promotion of collaboration with non-academic partners within and beyond Europe. At the University of Utrecht she is professor of e-research for the humanities. She studied Dutch language and literature at Utrecht University, did a PhD track in theoretical linguistics and made the switch to language technology in 1985 when she started working on machine translation at Philips Research. 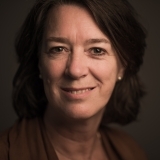 She has been professor of language technology at the Universiteit Twente (UT) since 1992, and is director of the Erasmus Studio for e-research at the Erasmus Universiteit Rotterdam (EUR).